The Invisible Continent offers invaluable insight for individuals and companies seeking success in the twentyfirst century, Kenichi Ohmae, the bestselling author of the groundbreaking book The Borderless World, looks ahead to the future of business in the age of the Internet and sees a rapidly changing landscape-one to which we must adapt or face the consequences. Ohmae unveils this new economy's four basic forces-the visible, invisible, cyber, and high multiple dimensions-and shows how a dramatic and volatile battleground is forming between companies and the countries that try to regulate them. Replacing countries (and their borders), Ohmae anticipates a world where the most powerful forces are "platforms." These invisible platforms are the universal standards that dominate the market. For example, Ohmae shows why English has become the de facto official language of the Internet, giving English-speaking countries an enormous advantage in e-commerce. He explains why investors must seek out and find these emerging platforms and shows what criteria they should look for. Looking at today's hottest industries like e-commerce, banking, and telecommunications, Ohmae distinguishes between the old-world titans, like IBM, GM, and CBS, and the new-world Godzillas, like Dell, Cisco, and Microsoft. It's the Godzilla companies that grow fast, move fast, and devour everything in sight. Together, they will forge the economy of the future. 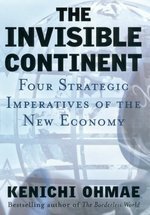 Just as The Borderless World foresaw a globally interlinked economy, The Invisible Continent maps out the coming technological revolutions and the impact they will have on businesses around the world. It is a must read for anyone seeking to attain and keep a competitive advantage in today's markets.